1. This is the place to tell your story about finding your perfect dress. Mention where you found it, the designer and your dress shopping experience. Feel free to pass on any tips you want. Don't forget to load up a picture. 2. Share information about your wedding day, the special things you did to make it special for you. 3. And reveal to us what one piece of information you wished someone had shared with you to avoid problems while you were planning your wedding, that you had to find out about the hard way. 4. Feel free to post a review on how the information you found here on this website was helped you. Let us see your bridal gown choice. Reminisce about your wedding by sharing your story, tips and reviews right here. The maximum size allowed is 800x600pixels. So please use your graphics software to re-size your pictures before uploading them. 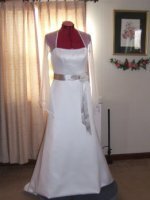 Click below to read contributions from other brides about their experience using Perfect Wedding Dress Finder.